Traditions – every person and every family has them. Most of us think of a tradition as something that we do during the holidays or special events. What if one of those traditions was philanthropy? What if philanthropy was something that not only occurred with families during a holiday but also was a part of our lifestyle? As adults, we can teach the children in our lives a tradition that will become a part of their lifestyle and a part of their value system. There are a variety of ways to teach children to respect the needs of others and do kind things. Children need to know that it is important to give of ourselves to others. As adults, we can teach philanthropy every time we talk to children and by demonstrating compassionate behavior through giving. We can demonstrate how to give our time, talent, or treasure. How can adults be philanthropic role models for children? One way is through volunteering one’s service in a community. Volunteering or providing a service is one of the best ways an adult can be a role model for lifelong philanthropic giving. Character and self-esteem are enhanced when children are engaged in volunteering. Many times when children volunteer they acquire new skills, develop confidence and maturity. Helping others helps children put their own problems in perspective. Children also meet people from other backgrounds and learn teamwork and civic responsibility. Research shows that youth who volunteer early in life learn that service or philanthropic giving is a part of their lifestyle. Remember philanthropic traditions do not have to be elaborate. Volunteering with young children can be singing at a nursing home or as simple as putting spoons in a container at a soup kitchen. 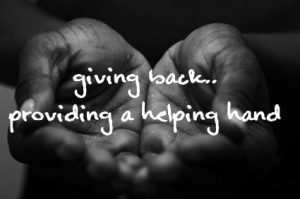 It is the basic idea of seeing philanthropic giving as a tradition that adults are teaching children. Cindy Bond is an Assistant Professor and County Extension Educator in Guernsey County (Crossroads EERA). Posted in Leadership Development, Sustainable Communities	Tagged philanthropy, service, traditions	Bookmark the permalink.